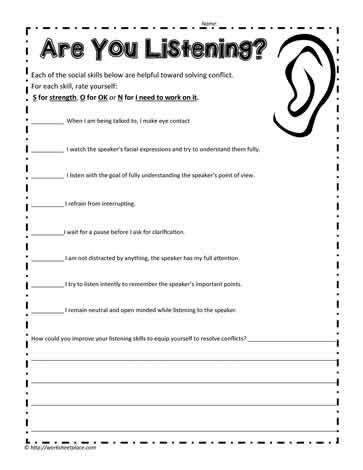 Here are the skills for listening. Each of the social skills below are helpful toward solving conflict. S for strength, O for OK or N for I need to work on it. I watch the speaker’s facial expressions and try to understand them fully. I listen with the goal of fully understanding the speaker’s point of view. I wait for a pause before I ask for clarification. I am not distracted by anything, the speaker has my full attention. I try to listen intently to remember the speaker’s important points. I remain neutral and open minded while listening to the speaker. How could you improve your listening skills to equip yourself to resolve conflicts?